Pokemon players might never get a look at what it's like to be on the dishonest Team Rocket. The premise of the Pokemon games has always been an uplifting one. Work hard, be honest, and be kind, and you'll rise through the ranks of the Pokemon world to become the very best, like no one... well you know what I mean. But what about the dark side of Pokemon, represented by groups like Team Rocket? What's it like over there? We may never know, according to Game Freak Pokemon director Junichi Masuda. 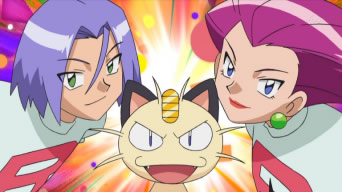 Masuda was recently asked by Official Nintendo Magazine if Game Freak and Nintendo would ever create a game where players fill the shoes of a Team Rocket member. Masuda basically shot the idea down. "That's a difficult question to answer," Masuda said. "But when you think about Team Rocket, while they're quite comical, they're still bad guys when they try to steal other trainers' PokÃ©mon." "Imagine watching football on TV, for example - you want them to play fair," he added. "I want players to play as heroes in videogames, and I want them to play fair." Team Rocket definitely doesn't fit the "play fair" philosophy of Masuda. The group is known as an organized crime syndicate that abuses Pokemon for their own profit and goals, often stealing them from honest trainers. Playing as a member of Team Rocket would definitely be a big change for the Pokemon series, but it wouldn't be impossible. If players took on the role of a character that brought the organization down from the inside, it could be a nice change from the typical Pokemon protagonist. This, however, would require quite a bit of innovation on Game Freak's part.